Share your pet's ornery side with this fun tank from Parisian Pet! Does your pup think he (or she) is the boss of everything? Well, even if it's not true, they can feel like the king (or queen) for the day when they wear this sassy dog shirt. In fact, this just might be the perfect tank top for your CAT! 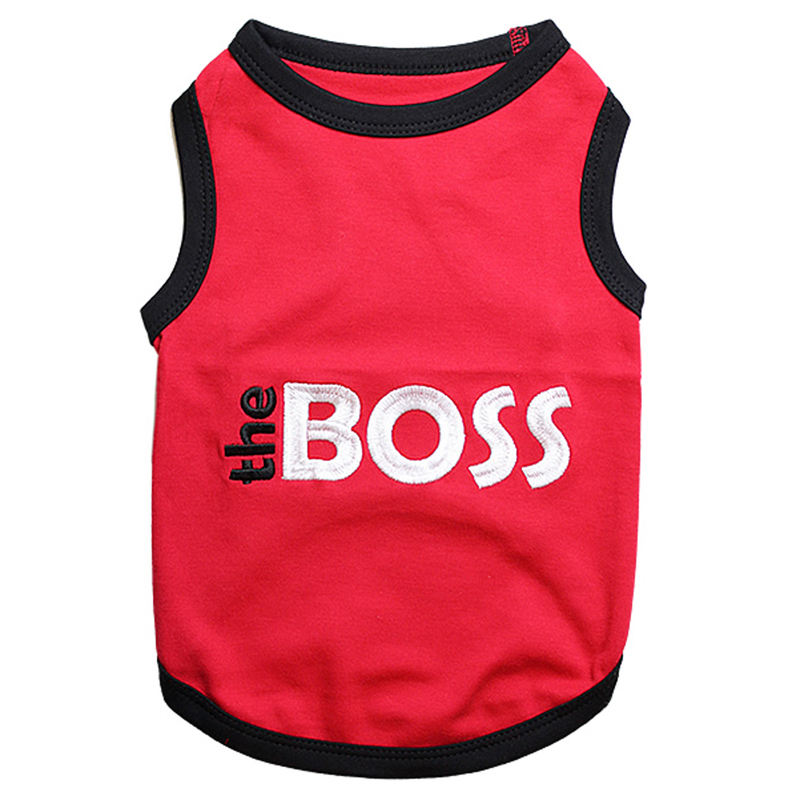 This quality pet tank top features lovely embroidery that says "The Boss" just in case anyone is confused about the pecking order. The bright red and contrasting black trim are also a bold statement. We love the substantial feel of this quality knit. 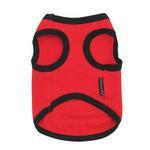 It's soft, breathable, and sturdy, and your pet will love wearing this well-made garment. This tank is 100% cotton. Machine washable. Dry Flat. 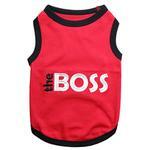 The BOSS Dog Tank - Red with Black Trim Customer Photos - Send us your photo! Thank you Baxterboo for the cutest shirts! The quality is really great! And of course this one really describes our little guy because he just thinks he is The Boss. Yadi loves his shirts to keep him warm in the house when the air is on. He loves to play ball just like his namesake Yadier Molina. He has the best personality and is the sweetest thing ever! Now shopping for him some PJs. I hope he likes them! Mickey wore this to his doggie day camp for Boss' Day and they put him to work, lol. He makes a great helper as long as payment given in belly rubs and kisses. Walker T R is a three pound teacup poodle, 7 years old. He likes to go on walks and rides in the car. He loves all his clothes from Baxterboo. Posted On 01/09/18 by Lisa R from Orange, VA Yes, Lisa R recommends this product! Bought this for my dog as a Christmas gift because, let's face it, she is THE BOSS. Very well made. Always happy with this brand. Posted On 12/18/17 by Dolly's Mom from Orange, VA Yes, Dolly's Mom recommends this product! Very well made and will look great on my dog. Bought it for her as a Christmas gift. Posted On 03/09/17 by Michele S from Eatontown, NJ Yes, Michele S recommends this product! As a matter of fact he is wearing it today. It looks great on him. Does not look cheap. I like the quality. 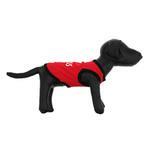 Red looks good on a dark colored dog. This tank is the BOSS! My chihuahua-poodle mix loves showing this one off at the office! It took her a few weeks to grow into it, but now it fits perfectly. Great quality, fast shipping. Nice light weight outfit to keep the doggy warm. Posted On 08/26/16 by Irene E from Roswell, NM Yes, Irene E recommends this product! We liked this shirt so much that I ordered it one size up! Posted On 07/31/16 by Diane J from Hillsborough, NJ Yes, Diane J recommends this product! Jack is the Boss man in this house. He is the protector. It fits him nicely. He was so upset when I put it away until Halloween. He LOVES to have new clothes. I had looked for his vest/harnesses to see if they have stripes. I brought them out and he looked very happy thinking he was going to wear one but then I hung them back up. You had to see this sad dog. Posted On 07/27/16 by Jaime M from Port Charlotte, FL Yes, Jaime M recommends this product! 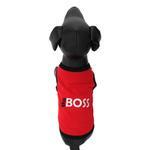 I purchased this because my dog is definitely the boss! Fits him comfortably (he is a min pin terrier mix). Love this shirt...really well made and it gets lots of attention from people, I tell everyone Baby Jade does run the house, so I though it only fitting she wears her title! Lol! I fell in love with this shirt as soon as I saw it and my Toby is the Boss. Love the way this brand fits and the material that is made out of. Posted On 05/29/16 by Cijai B from , AZ Yes, Cijai B recommends this product! Posted On 04/21/16 by Maryann E from , FL Yes, Maryann E recommends this product! Posted On 03/20/16 by rebecca w from Hartford , VT Yes, rebecca w recommends this product! Runs small. I bought a size small for my 5 pound chichuhua. Wish I would have bought a medium. Very well made. Posted On 02/15/16 by Patricia D from , CA Yes, Patricia D recommends this product! Little Bentley gets lots of chuckles when he wears this one! Good quality & fit. Posted On 12/26/15 by Susan L from Goodyear, AZ Yes, Susan L recommends this product! Winston feels he's the "Boss" around the house so this was a perfect tank top for him. Very nice and well made. Posted On 11/09/15 by faima s from surrey , Yes, faima s recommends this product! Posted On 08/17/15 by Melissa M from Orlando, FL Yes, Melissa M recommends this product! My little Mickey will wear this to doggie day care on Bosses Day. It is good quality/well-made and he looks great in it for sure. It fits so nicely. The size is very accurate. This tank shirt says it ALL! Posted On 06/10/15 by Brenda from , TN Yes, Brenda recommends this product! The tank top is very well made, but I thought it ran little smaller than most shirts and/or hoodies in size small. However, since my pooch is so small it worked well. Posted On 05/14/15 by Janice H from Austin, TX Yes, Janice H recommends this product! It's super soft and the spandex makes this tank a great fit. This tank does run big. I love the embroidery. First time in my life that I am able to shop the way I always wanted for my dogs and all the dogs I will be buying for..It's convenient to order online, clothing is made very well, good fabric, good stitching, colors, sizing.. in general, this is the best find.. and noone told me. I just googled "cute dog clothes" and BaxterBoo came up..